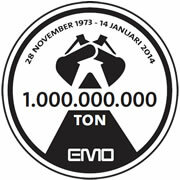 EMO hit a new dry bulk discharge record on January 14th, 2014, with the billionth tonne of dry bulk. A milestone for Europe’s largest dry bulk terminal has been reached. Forty years ago, EMO unloaded its first tonne of iron ore (November 28th 1973). Now the terminal has reached the billion tonne mark. The honour goes to the Vale China. The Vale China, with its 375,000 tonnes of iron ore, is one of the largest dry bulk vessels in the world. The vessel is 362 metres long, 65 metres at the beam, and has a draft of 23 metres.Using three 85-tonne grab unloaders, it takes approximately four days to unload the Vale China. Thanks to EMO’s unloading capacity and draft, the EMO terminal is an ideal destination for this huge bulk vessel (EMO).